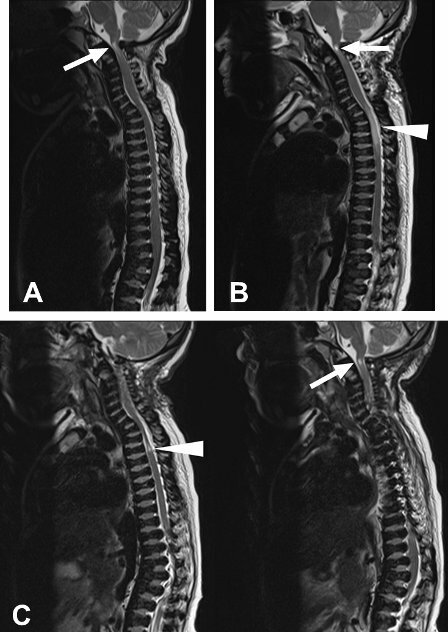 A 16-year old young woman with Morquio syndrome presented with magnetic resonance (MR) imaging changes secondary to spinal cord compression at C1. She had undergone a posterior C1 laminectomy for craniocervical stenosis and atlantoaxial hypermobility at the age of 8 years and had remained neurologically normal. Routine follow up MR imaging at age 16 demonstrated recurrent spinal stenosis at the level of the atlas (AP diameter of spinal canal measured 8 mm) with abnormal T2 hyperintensity in the cord extending from the foramen magnum to C2/3 (Figure 1A). These findings were interpreted as indicting cervical myelomalacia. Her upper cervical sensory function was intact and there was no evidence of lower bulbar cranial nerve dysfunction. Vibration sense in her lower limbs was minimally decreased but normal in her upper limbs. Deep tendon reflexes were brisk at her elbows and knees. However, ankle jerks could not be elicited and she had no plantar responses. Muscle power was limited at 3.5/5 in upper and lower limbs because of the joint changes due to her underlying disease. She was independently ambulatory although she used a motorized wheel chair for mobilization outside of her home. In view of her progressive spinal cord compression, operative decompression and fusion was recommended. Prior to the operation, the patient’s tolerance for the prone position was tested with her awake by having the patient lie prone, on transversely positioned supports, with her head flexed on her chest for several minutes. No neurological symptoms were provoked by cervical flexion, prone positioning or both. It was felt that she would tolerate the positioning necessary for the operation. After successful induction of anaesthesia, the patient was placed in a pin fixation headrest and was turned to the prone position on transverse upper chest and pelvic bolsters, on the Jackson table. Cranial cervical alignment was maintained during the roll from supine to prone position. Following placement in the prone position, blood pressure initially increased, and then dropped minially but responded to analgesic administration. Baseline SSEPs and MEPs were measured prior to the incision. Initial MEPs demonstrated good responses in the upper limbs bilaterally but no response in the lower limbs. There was no technical or anaesthetic explanation for the absence of MEPs to the lower limbs and it was assumed that this was due to her underlying disease. SSEPs showed poor responses in the lower limbs and asymmetrical responses in the upper limbs with a greater left-sided suppression. During the decompression, the SSEPs and MEPs (upper limbs normal, lower limbs absent) remained stable and unchanged from the baseline. During the decompression upper limb MEPs fluctuated. The fusion was deferred given the change in evoked potentials. The patient awoke from anaesthesia with a complete sensory-motor paraplegia to the T4 level and intact upper limb sensory and motor function. Figure 1. Sagittal T2-weighted magnetic resonance images of a 16 year old female patient with Morquio syndrome. Immediate post-operative MR images revealed a new area of T2 hyperintensity with diffusion restriction in the cord between C7 and T3/4 which was suggestive of ischemic insult from T1 to T4. There was no change in the cervicomedullary cord signal compared to pre-operatively (Figure 1B). 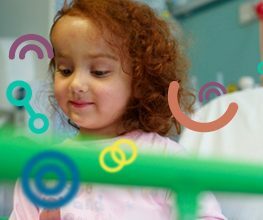 At 14 days following surgery, the patient was ventilating comfortably using her diaphragm and had a normal motor and sensory examination at and above T4. She had impaired sensation below T4 and no perceptible sensation below T10 with flaccid total paraplegia and neurogenic bladder and bowel. MR imaging at 3-month post-operation showed near complete resolution of the cord T2 hyperintensity between C7 and T3/4. However, a marked narrowing of the cord from C7 to T2 was observed along with a small focus of T2 hyperintensity at T2/3 suggestive of myelomalacia. The T2 hyperintensity at the craniocervical junction and focal kyphosis at C7/T1 were unchanged (Figure 1C). Follow-up at 12 months showed persistence of the complete sensory motor paraplegia with evolving spasticity. This tragic event illustrates that patients with skeletal dysplasia may be at risk for ischemic spinal cord injury at levels remote from areas of maximal anatomical compression while under anaesthesia in the prone position. It is postulated that this would be the consequence of impaired cardiac output, due to impaired cardiac filling from cardiac compression. Bolsters oriented across the chest deformity appear to contribute. Avoiding transverse chest bolsters and attention to cardiac changes when positioning on bolsters, of any orientation, seems prudent. Cardiac output can be measured using trans-esophageal instrumentation and can serve as a warning for impaired cardiac output with chest compression. Awake testing of the patient’s tolerance of the prone position may not be sufficiently sensitive to detect the risk of injury while under anaesthesia. The lower limb MEPs should have been assumed present in our ambulatory patient. Baseline MEPs should have been recorded after induction and before positioning in the prone position. The absence of MEPs following positioning prone should call for an immediate return of the patient to the supine position.